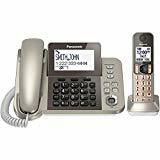 If you’re in the market for the best home phones for seniors, it’s a good thing you decided to start your research on our website. Instead of having to browse through countless alternatives, you can make good use of our carefully researched information and consider your options. According to our findings, the first product of interest would be the Panasonic KX-TGF350N Corded/Cordless, due to its many useful functions. First of all, its noise reduction feature can allow its user to hear phone calls even in noisy backgrounds. It comes in a champagne gold color, perfect for a chic home interior and easy to integrate with your other furniture and decorations. Last but not least, you have the possibility of blocking up to 250 unwanted calls. Should this item be unavailable, we suggest you check out the AT&T CL4940 Corded instead, as it would make for an excellent second choice. Whether you like to sit down or move around freely while having phone conversations, this option offers it all -- a cordless and a corded unit, both in a champagne gold design. You do not have to be very handy with technology, as the base unit is very easy to use. The large LCD screen shows the caller ID, and it can be adjusted for maximum visibility. If you lay the device face down, you can accidentally activate the talk and off buttons. It is best to keep it in its place. 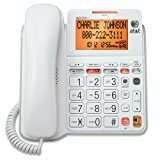 It is an option worth considering for any senior needing a landline. Seniors or people with hearing issues are going to like the audio assist function this product comes with. This feature increases the volume of the voice, to make sure that the user can hear the other person. The design is clean and easy to understand and use, making it perfect for those who are not into sophisticated technology. It can be mounted on the wall or the table. The phone functions in a power outage, but none of the other features will. You will also have to reset it from scratch. The phone is an excellent choice for any senior or person with hearing issues. This is a cordless option with a small, but very functional design. The volume boost control will help you hear clearly, as it can go up to 40 decibels. This is great especially for people with hearing problems. The best function is the slow talk option, ideal for the elderly, which offers you the opportunity to slow down the speech and hear it in your own time. The volume control buttons are badly placed, as they are right in the grip area, as some owners mentioned. A cordless option, with large buttons. It’s very easy to set up and use. Should you be looking for a good alternative available for sale and you have no time to browse through countless reviews of home phones for seniors, we’ve selected a few of our top choices to give you some perspective. Check out the most desirable features in these devices to know where to start your search. This option features both a cordless and a corded alternative that both come in the same champagne gold design that you’ll have no trouble integrating into your living room. It works great this way because you can either sit down and have a long conversation or enjoy the comfort of moving around and go about your business while talking on the phone. The base unit is easy to use, so it’s excellent for those who aren’t so handy with new technology. It features a large 3.4 inch LCD that shows the caller ID and can be adjusted to obtain maximum visibility. You also have up to eight hours of battery power backup that you can use in the case of a power outage to make a few phone calls and make sure your loved ones are alright. Its noise reduction function works in a noisy environment, making sure that the user hears the call over the backgrounds sounds. One of the most useful features of this product has to be the audio assist function, which is excellent for seniors with hearing issues. It temporarily increases the volume of the voice and makes sure that the user hears the other person on the phone. It has a clean design that’s easy to understand and subsequently, easy to use, making this item an excellent choice for those who are less experienced in using sophisticated technology. The display shows the caller ID as well as the time and date of the calls that you’re receiving. You can mount this phone on a wall or a table, that’s entirely your choice. Also, it has the storage capacity of up to 50 numbers. Many useful accessories are included in the packaging, such as a handset, a wall-mount bracket and most importantly an abridged user manual that will take you through every step of the installation process. This cordless design is small and highly functional, while also being easy to use. You will be able to hear clearly due to the volume boost control that can go up to 40 decibels. People with slight hearing problems can use it. An aspect worth mentioning that’s helpful especially for the elderly is the slow talk option, which gives you the opportunity of slowing down the speech and hearing it in your own time, to understand it correctly. This function works both in real time and in the case of recorded messages. The LCD shows you the exact time and the caller ID when it’s the case. The enlarged memory dial buttons make this device easy to use by anyone. Aside from the primary functions, this phone also has a speakerphone, a talking keypad, and notebook, nine speed dials that you can use to keep your friends and family close and 250 blocked numbers to avoid unwanted calls. An option great for those who are suffering from hearing or memory loss, this phone can help them by amplifying the incoming sound for the user to understand the conversation clearly. It can even go as high as 26 decibels. To help those with memory loss, this device uses nine speed dial numbers paired with pictures of the persons to be called. This way, even if you don’t remember the name, you can rely on your visual memory to make the connection, and you’ll be connected with your loved ones in no time. You can use this product while you’re wearing a hearing aid. A built-in speakerphone not only gives you the opportunity of hearing amplified sound but also lets you move and go about your business as you’re having a conversation. It can be wall mounted, or you can install it on a coffee table, whichever you prefer. One way that this device can help you with your memory loss problems is the inclusion of four photo slots on the speed dial keys. You can keep photos of your close friends and family and make the visual connection instantly. The auto answer function also works for five preset numbers of your choosing. The 16 digit design and LCD make this alternative easy to understand and operate, even by less experienced users. You can adjust between five levels of contrast to make sure you get the maximum visibility and clearly understand who’s calling you. Its number buttons are oversized to make them easier to read. A red key that reads SOS is also built into the phone and can be used in extreme situations. Its color makes it easy to spot. Many useful features are offered including caller ID and speakerphone that has a range of up to 16.5 feet. This model is great for those who are not used to technology, given that it provides large buttons that can be operated without any trouble even by the less handy users. For the customer to get the best version of the conversation, the phone minimizes sound distortion and allows you to customize the volume until you reach the clarity that feels satisfying. Your memory loss can be solved with the picture speed-dial buttons that this model displays. This way you won’t have to remember the name. All you need to do is to keep photos of your close ones in the slots provided, and they’ll be just a click away. The packaging also included a microfiber cloth manufactured by the same brand that can pick up dust and dirt and keep the device sparkling clean. It’s important to make sure you’re using the appropriate cleaning method since this is a sensitive piece of technology. When you’re looking for good home phones for seniors, making the right decision can be a difficult task. Whether you’re searching for a gift or just an item for yourself, the key features that you should consider have all been discussed in the following buying guide. We all know how experiencing new technology can be a little confusing even for the youngest amongst us. Imagine how difficult it must be for someone who’s not used to being surrounded by gadgets on a daily basis. The key to finding the right phone is to think simple. A minimal design with large dial buttons that features few of them as possible might be the right way to go. Sure, there are advantages in choosing a model that features an increased number of options, but the truth is they may never get to be used if they’re not adequately understood. An essential aspect that should also be discussed here is the importance of a user’s manual. Any item that you consider buying should come with detailed instructions on how to install and how to use the phone, written clearly in fonts that are easy to read. You can oversee the installation process, and you might even briefly explain the primary functions of the new device, but the manual is no less crucial. It’s painful to watch our loved ones deal with these types of issues, but the one thing we can do is make sure they have all the comfort and helpful technology that they need to get through this challenging stage of their lives. The solution when it comes to phones is the speed-dial photo slot, featured by many manufacturers these days. What this means is that some speed dial buttons are provided, and they can be assigned to contacts that need to be within reach. They can even be included in an auto-answering function, but that’s not relevant. The way this works is each speed dial button has a photo slot where you can insert photos of the people whose number the user will be calling. This way, even if they can’t remember names, they can rely on their visual memory to make a connection. Another problem usually encountered when talking about the eldest among us is hearing loss. Dealing with this can affect your daily activities drastically. If you’re in a stage where you need to use a hearing aid device, then aside from a phone with a high volume you also need to look for items compatible with your technology. If that isn’t the case, you merely need to make sure that the product you end up buying will allow you to adjust the volume to as high as you need to understand the conversation correctly. An attractive option that not many phones have is the slow talk function. This allows the user to slow down the voice of the other person on the phone, either in real time or on a recording, and understand the words and phrases in their timeframe. Aside from these major problems that need to be tackled with, many less discussed aspects can genuinely make a difference if they’re treated the right way. For example, the shape and color might not matter all that much, but if you’re in the market for cheap home phones for seniors, at least make sure it doesn’t look tacky and visually integrated with the design of the room and the furniture. The budget can be a sensitive issue, but it’s safe to say that since you’re not necessarily looking for a device with an impressive number of extra functions, you will probably encounter mid-range options. Other important aspects include making sure that your product of choice has functions that you might find useful, such as speakerphone, storage options, caller block or noise reduction. If you find this topic engaging and you want to learn more on the subject, consider reading other articles that have also been published on our website.